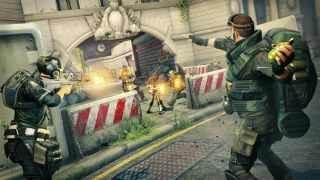 Dirty Bomb’s final update will make the team-based shooter entirely free. Splash Damage announced the end of active development last year after it failed to attract a large enough audience, though it said servers would keep running for as long as the player count supported them. The developer wants to celebrate the end of its development by letting old and new players access everything for free. It was already free to play, but as of January 15, it will shed all of its microtransactions, too. Mercenaries, weapon skins and obsidian loadout cards will all be free, while RADs, Dirty Bomb’s premium currency, will be removed from the game entirely. All Steam DLC has already been removed. Splash Damage has also added more items to the list of things you can trade on Steam, including all loadout and weapon cards. If you’ve still got RADs, they will be converted into credits, a free currency that can be spent on special cases, including event cases from previous events, and trinkets. All players will also earn credits at a faster rate, up from 19 per minute to 50. Despite shedding microtransactions, it still looks like some of the grind associated with F2P economies remains. If you join as a new player and want to unlock an event chest, for instance, would need to play for 16 hours to get 50,000 credits. Winning matches nets you a boost, however, and missions offer you more, too, so it probably won’t take you that long, but you will need to put in the hours to get crates and trinkets. Last year, Evan called Dirty Bomb one of the best multiplayer FPSes you probably aren’t playing. “DB's low recoil guns and the low deceleration penalty for jumping translates to excellent and tense dances, close-range duels where the movement decisions you make have a major impact on the result,” he said.